In anticipation of the LNAH’s 19th season, I think it’s time to take a look at some of the reasons why people in the hockey world constantly talk about this league. The LNAH’s legacy lays in its hockey fights and no holds barred attitude towards them. While some do not like the audacity of fights happening for no reason, it’s no shock to see why people do. Everyone loves a good hockey scrap, even if it happens at the opening faceoff. It’s no secret that teams pay players just for their fists. A star fighter signing with your team could guarantee a money pile with tickets sold. 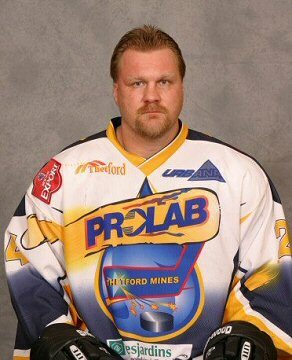 The LNAH turned pro in 2004 after operating for 8 years as a senior semi pro league in Quebec. Its reputation quickly rose as the toughest league in the world and for its lack of skill level. Thankfully, its skill level his risen quite a bit and earned itself some credibility, complete with NHL stars suiting up during lockout years. One of the league’s craziest enforcers came in the form of a guy named Link Gaetz. Kids, ask your parents, uncles, grandparents, mailmen, pizza delivery guy, and I’m sure each one of them can recite a crazy story (on or off the ice) about Gaetz himself. Of course, some would come in the form of drinking stories as Gaetz could down the alcohol like it was going out of style. Search for him on google and words that come up include the word psycho. Whether the story was true or not, his reputation as the meanest and most insane hockey player to ever lace them up is solidified. Gaetz grew up in the west coast of Canada, enforcing his way through teams in the WHL and IHL. After being drafted 40th overall in the 2nd round of the 1988 NHL entry draft, the Minnesota North Stars took a chance on Gaetz to have him for protection on their star players, more specifically, a guy named Mike Modano. Legend has it that Gaetz was in a bar fight the night before and showed up to the draft with two big, swollen black eyes. This is just the tip of the iceberg of stories that follow Gaetz around like the plague. His stint in the NHL came in the form of two teams. 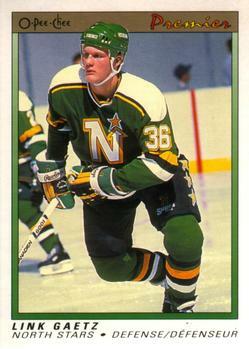 The aforementioned North Stars and in 1991 when the San Jose Sharks took him in the expansion draft. His list of opponents on his fight card is not only endless but impressive: Joey Kocur, Kris King, Randy McKay, Warren Rychel, Bob Probert, Kelly Buchberger, Mike Peluso, Gino Odjick, I could go on. He managed 412 PIMS in 65 games while in the NHL. If you’re keeping score, that’s not even a full season. In one of his more known stories, Gaetz’s NHL career came to a screeching halt (no pun intended) in 1992. Driving with a friend who was under the influence, Gaetz was thrown from the passenger seat after losing control on an off-ramp. He ended up with many facial and back injuries and a paralyzed left side after the injuries moved up to his brain stem. He was lucky to be alive. Any other person would probably take that as a wake up to how your life was playing out. However, we’re talking about Link Gaetz. He’s an entirely different personality. That fall he was arrested and convicted for his own DUI. Gaetz was traded to the Oilers soon after but never stepped on NHL ice again. Gaetz’s legend might come more alive in stints with the various minor leagues he was in. Hell, the lineup of cities he played for looked like a KISS comeback tour: Mexico City (Mexico), Madison (Wisconsin), Toledo (Ohio), Anchorage (Alaska), and more. In San Antonio, he was kicked out of the Central Hockey League for life for trying to saw off the arm of Dallas’ Frank LaScala. In the LNAH though, is where he gained icon status. Gaetz played for seven seasons over 6 teams. He even managed to contribute on the score sheet for the Riviere-du-Loup Promutuel in the 2002 playoffs. One of his better fights came in the form of a bout and maybe rivalry with another LNAH heavyweight, Patrick Cote. Upon watching that you might say to yourself “Jesus, why didn’t the linesmen break it up earlier? !” Well son, this is the LNAH. The rules are different. You try telling a guy who has beaten up a miner in Quebec and left his face dismembered or shot out the stain glassed windows of a church without a gun permit while hammered. There’s just something not right. Gaetz’s antics have spoiled over to the penalty box where he’d be eating hot dogs, to running up into the crowd, to numerous bar fights and brawls after the game. Like I said, everybody has an “I heard Link did this…” story. It’s up to you to figure out what is true or not. The crazier they are, the truer they become. Gaetz has retired from the game and has been since 2010. Hasn’t stopped him from creating more urban legends however. As of February of this year, Mounties on the west coast are out for him. A warrant for his arrest was put out by a provincial judge in Kamloops, B.C. for his failed court appearance. In 2012, Gaetz was charged with assault and causing a disturbance. Link Gaetz will always be considered a legend in the hockey world. It may not be for the same reasons as most but there is no doubt that he one of the best personalities the game has ever seen. The game was a different monster in the early 90’s and it fueled a different breed of player. Gaetz may not remember most of the tangles and scraps he’s been in but his fans won’t ever let him forget.